Why implement a hardware solution? A plug-and-play solution. Plug in the system, enter an IP address and IPserver is ready to run. Ordering, installing, and configuring NT/2000/XP or Unix-based alternatives takes far longer and requires specific systems experience. No permission required. IPserver is a network solution to a network problem. Especially in large organizations, network administrators appreciate the ability to implement and manage without "help". Alternative systems may require detailed planning and ongoing coordination with system and database administrators (already busy with other projects). High performance. Just like your routers, IPserver delivers packet-level network services in real-time. Unlike alternatives running on your application servers, IPserver offers tightly integrated IP management function with low latency under high demand. For example, independent tests show IPserver Dynamic DNS registrations occur within milliseconds, performance which is sustained through heavy loads. Low cost. IPserver hardware is less expensive than alternative server platforms appropriate for the task. More important, the ongoing cost of ownership is far less than with complex general-purpose servers. Simplified support. As a total hardware/software solution, IPserver eliminates any question of incompatible hardware, drivers, service pack levels, or third-party complications. What makes the hardware special? The hardware chassis is a compact and rugged all-steel chassis designed for use in harsh, remote, and space conscious environments. The mechanical quality of the system is very high. 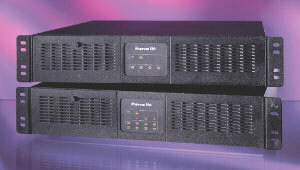 The slimline rack/bench mount chassis of the S55 is only two rack units high. Rack mounting brackets are provided which can easily be removed for bench top applications. All components are modular and can be quickly replaced or upgraded as necessary. The name service processor, network access, and memory functions are integrated on a single board that can be upgraded as necessary. Front-mounted LEDs show IPserver network speed, link integrity, transmit, and receive packets. Units operate as fully redundant pairs, so operation of your network is not affected. Support includes next day shipping of a loaner chassis and repair of the existing unit options.